One of the best things to come out of Google+, besides all of the great ongoing discussion about gaming, is a funny little role-playing game from A. Miles Davis called Homicidal Transients. I use "funny" because it is applicable in a couple of uses of the word: humorous and peculiar. I mean both of these in a good way. There is a lot of good stuff to be found in this little game (weighing in at a whopping 41 digest-sized pages). This is a game that works at the digest size, instead of inflating page counts for games that most likely should have been done at a traditional page size. In this game you play homicidal transients, pretty much like it says on the tin. This isn't a game mocking the homeless or making homeless people into some sort of reprehensible figure. This is not Bumfight The RPG. And, having been homeless in the past, I can say "thank God for that." Playing a transient has absolutely nothing to do with being a homeless person, although it could if you wanted it to. I know, that's a bit of a weird double standard. I have nothing against playing or portraying a homeless person in a role-playing game, as long as it isn't done in an exploitative or insensitive manner. I don't think that Homicidal Transients does either of those things. There's not a lot to this game, so if you need a game that has a lot of rule, or that has a lot of rules to enforce a certain mode or style of play...this game is not for you. If you like a rules light framework that will allow you a lot of freedom within those rules to do cool and interesting stuff...this just might be the game for you. Characters are defined by a handful of skills (five of them in all), two traits (homicidal and transient), and a level. Level works pretty much as a bonus to your attempts to have your character do something. 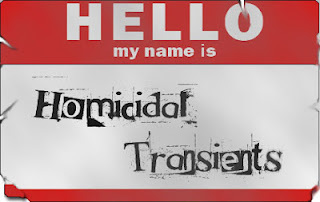 Homicidal and Transient give your character special talents and abilities. The skills work much like the skills in any other RPG that you may have seen or played. There are no attributes. The game uses a single for combat, skills, tests and everything else. The cool thing is that it uses a pool of whatever dice you have the most of sitting around. Everyone uses the same dice, but the game isn't linked to the use of one particular die type. I think that is one of the qualities that would make Homicidal Transients a good game for pick up play. Skills do not seem to have levels, as much as they have modifiers due to the talents that your character has (not to mention situational bonuses). This part of the rules is a little bit confusing, as you aren't really told if there is a bonus from skills (or I somehow managed to miss it), or if you just use bonuses given from talents. That could stand to be better explained in the rules. While I don't mind it (maybe because I am mostly a GM), someone out there will be upset by the rules for experience: "Go up a level whenever the GM says so." I wouldn't play in a group where there isn't trust between the players and the GM (and I cannot fathom why someone would play in a group like that), so I don't have a problem with a rule like this. The rest of the game is rounded out by "magic" powers, monsters, equipment and vehicles, and all of those other things that are expected in a role-playing game. There is no setting, implied or otherwise, in the game, which allows you to tack on your own setting to the system. I can see using this for cyberpunk-styled games, or games in the style of something like Battle Royale. Or pretty much any game that consists of beating things until they are dead. I'm sure that there is (or will be) a D&D hack of Homicidal Transients out there someplace. This is a good game. A very good game for someone's first time at professionally designing a role-playing game. As with any rules light game, there will be speed bumps as a play group realizes that much of what happens at the table will need to be figured out as you go, by on the spot rulings rather than explicit rules. I think that is a good thing for a game because it allows a GM flexibility for those unorthodox situations that players are so good at creating for their characters (and the GM's world). This is a game that you should have on your shelf (virtual or otherwise) if you want something light and flexible that you can use to get a game going fast, and that gets out of the way and allows the group to get to its fun. I'm glad that I have a copy of Homicidal Transients and you should want one too. The link at the very top of this post points to where you can buy the game in print or PDF (it is an affiliate link but that also helps to track down games that I can talk about with you here at the blog). 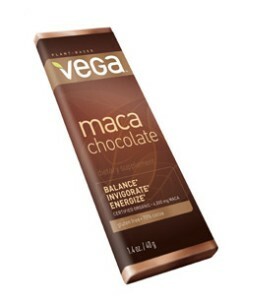 Because I don't just talk about games and music but also other things that cross my mind, I'm going to talk about a chocolate bar that I ate today, the Maca Chocolate from Vega (a Canadian nutritional company). Totally not shilling on this, I was given a sample bar after my mother was at a health foods show in D.C. this past weekend. In Peru, maca is prepared and consumed in several ways, although traditionally it is always cooked. The freshly harvested hypocotyl can be roasted in a pit (called huatia), and this is considered a delicacy. Fresh roots are usually available only in the vicinity of the growers. The root can also be mashed and boiled to produce a sweet, thick liquid, dried and mixed with milk to form a porridge or with other vegetables or grains to produce a flour that can be used in baking. If fermented, a weak beer called chicha de maca can be produced. In 2010 a US based brewery called Andean Brewing Company, became the first company to produce and commercialize beer made from Maca under the brand KUKA Beer. The leaves can also be prepared raw in salads or cooked much like Lepidium sativum and Lepidium campestre, to which it is genetically closely related. A lot of that makes no sense to me as a layman, but it is still interesting. Allegedly a energizer and revitalizer, it was used by Incan warriors before going into battle. It also was purported to have "male enhancement" properties, but anyone who watches any of the food travel shows on television will see similar claims for many foods around the world. This is, however, and interesting historical tidbit that can be used in a number of ways by the resourceful and geeky. I wasn't that impressed by the consistency of the bar. I found it a bit too hard, and I like more suppleness in my chocolate. It was also a bit more bitter than I like in a dark chocolate. The taste was comparable to the Vosges Creole Bar, which I felt was made entirely too bitter by the inclusion of the chicory. I didn't really notice any energizing effects of the bar. Would I track this down and buy one on my own? Probably not. I feel that I can get better chocolates with a comparable cocoa percentages that have a better taste and feel. However, if you're looking for some interesting verisimilitude for warriors in a historic setting you now have some starting research points. If you don't already own a copy of Trey Causey's excellent Weird Adventures, why don't you? I consider it an equivalent to the old WEG (now published by Precis Intermedia) book Bloodshadows. It has a mix of pulp fiction, traditional gaming fantasy and comic book fun all in one affordable package. The book is almost all system agnostic setting material, with what little writeups there are done in the style of Swords & Wizardry) and details a world where the paradigms of the heroic pulps and traditional high fantasy smash into each other like a J.G. Ballard car crash of gaming inspiration. Seriously, if you don't own a copy go here to RPGNow and pick up the PDF at least (although I really recommend getting a print copy). Now that you've clicked the link (and yes that is an affiliate link, my future reviews thank you), you can watch Trey and I talking around the Dorkland! Roundtable. There needs to be a licensed Warlord RPG. Someone with a real amount of money needs to get onto it, and then hire Trey to work on it. Judge Dredd is always a bit weird, particularly to those used to American comic books. Judge Dredd is sarcastic, sardonic, satirical and many other things that start with an S. Yes, the comic lampoons American culture on a regular basis, but that is a good thing. Sometimes it is good to have that outsider's view on what out culture looks like. The Judge Child Quest begins with a dying PSI Judge and a prophecy: the child who bears the eagle mark will save Mega-City 1. In the future world of Judge Dredd civilization is in the hands of the Justice Department, and the Judges who stop crime and judge the offenders. A Judge is a combination police officer, judge and executioner. Their word is final. Their word is Law. Part of the reason why I like the Judge Child Quest is because it goes across space and shows a much wider view of the setting than what we normally get in a Judge Dredd story. 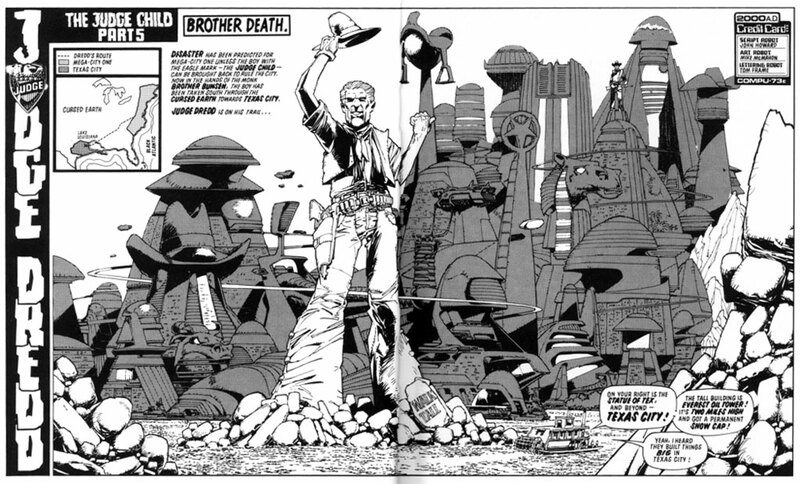 The story starts in Mega City, where the dying PSI Judge issues his prophecy and starts Dredd on a journey that goes to the Cursed Earth (the part of American still in ruins from the nuclear war that nearly decimated the world in the past) to Texas City to weird planets beyond the solar system. Dredd sees a great variety of people at their best, and at their worse. Even more, the Judge Child Quest causes a great deal of growth in the character of Dredd. I do not think that the person Dredd was at the beginning of the story would have done what the Dredd at the end of the story did. 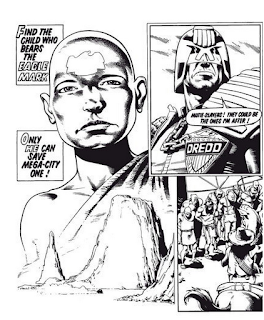 Dredd always puts the well-being of Mega-City 1 before his own, but in this case Dredd puts a lot on the line, knowing that he has to do what is right for Mega-City 1. I really suggest checking out the Judge Child Quest, if you haven't already read it. It is one of the best of the Judge Dredd arcs that I have been able to read. If you haven't read Judge Dredd, or your only exposure to the character is from the terrible Sylvester Stallone movie, I really recommend checking it out. DriveThruComics has a good selection of 2000AD magazines and other select Judge Dredd collections available in PDF form (currently on sale at the time of this writing). Yes, there is an affiliate code. It helps feed what I can write about on this blog. We talked about their current book Never Unprepared, and how the Engine Publishing/Gnome Stew people go through the process of creating one of their books. We also spent time talking about their influences as writers and gamers, as well as their love for older games. Martin's project to blog about the books from Appendix N of the AD&D DMG is a particularly interesting one that I plan to follow and see where he goes with it. Again, I had a great talk with talented creators and I am enjoying the insights that these Roundtables are giving me into the creative processes of other gamers and designers. I was able to get an early look at the playtest documents for the upcoming Nova Praxis game from Void Star Games. They have a Kickstarter in the works (and if you are reading this blog post from the future it could be already happening or finished). Nova Praxis is a transhumanistic science fiction game that uses Void Games Stands of Fate variant of the Fate rules as its underlying game engine. Transhumanism is a burgeoning genre in tabletop role-playing. Steve Jackson Games tilled the soil years ago with their Transhuman Space game, a game that featured collaboration between game designers and futurists to make a transhuman setting that seemed a probable extrapolation of the current world into a future one. Eclipse Phase by Posthuman Studios also goes over this ground, but adds an element of horror to the transhumanist SF. Both of these are strong games, with strong followings, that would be difficult for a new game to surpass and set its own ground. Some would say: Do we really need another transhumanist role-playing game? I think that's a dumb question because, at it's heart, transhumanism should be an extrapolation of today into a probably and plausible tomorrow. As today changes, so should the tomorrows keep pace. I seem to have fallen behind on posting the videos of my Dorkland! Roundtables here to my blog. Honestly, I thought that I had already posted this. I had a talk with Gareth Skarka of Adamant Entertainment recently. One thing that you'll notice is that this discussion took place before the announcement that ownership of the Icons role-playing game was transferred back to creator Steve Kenson from Adamant. We talked about a few things on the Roundtable, but a lot of time got spent talking about pulps (you can see the stack of Doc Savage reprints behind Gareth's head in the thumbnail), and James Bond. We also spent a bit of time talking about the James Bond RPG (put out in the 80s from Victory Games, an imprint of Avalon Hill). Apparently the talk of James Bond has sparked some discussion of the game over on Google Plus. As I've said before in my commentary on these discussions, I am enjoying the process of talking with other game designers and publishers. It is interesting to get into their heads a little bit and see what influences them as writers and designers. This discussion with Gareth is not different. I think that we get a little bit of a peek into how he thinks as a designer, and what motivates him to design. I like spells in my fantasy games. I like the feeling of magic and wonder that they bring to a world. I also like for the players in my games to have options for their characters. 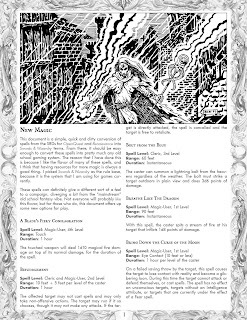 The linked PDF has 26 spells that are new to Swords & Wizardry, converted from the SRDs of OpenQuest and the Renaissance system. I am pretty sure that none of them have appeared in an old school or d20 game. The spells are split between Cleric and Magic-User spells, so there is something of use to either class. 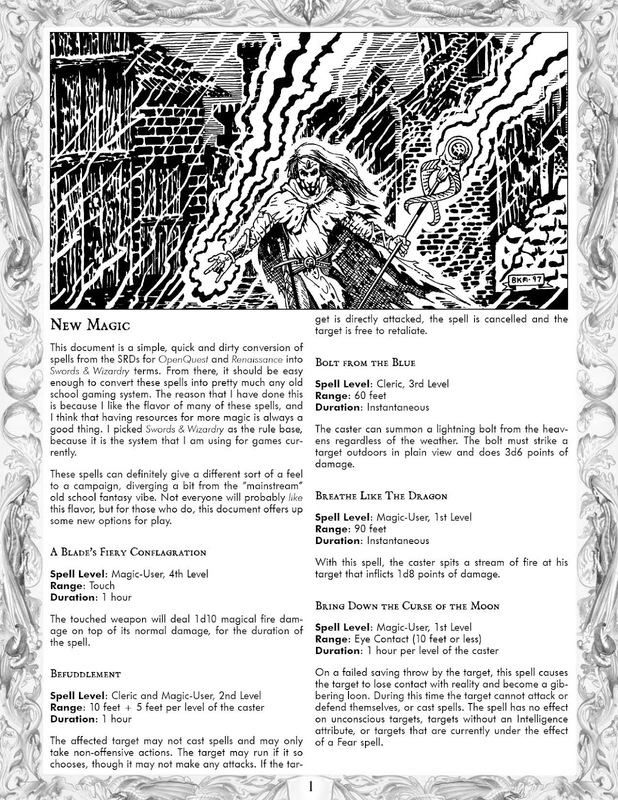 Some of these spells are a bit non-traditional, but that is why I am sharing them.